Over the course of time, the things we own get worn, tarnished, frayed, dirty, or faded (depending on exactly what we are talking about). Or in general, they just get old. Often our “knee jerk” reaction is to replace these things; to discard them and buy a new one. Even when said thing (lets call it a dinglehopper) is still fully functional, we still get the urge to replace it with a shiny and new dinglehopper. Part of the minimalist philosophy is to fight through these consumerist urges and see the true value of things. We need to appreciate the things we already own for their function, and not simply discard them because we have had them a long time and they’re faded; they no longer have that “new dinglehopper” look. First of all, the fact that the dinglehopper has functioned this long says a lot about it’s quality. There is no guarantee that the next dinglehopper will be as good. Second, In the end we’d be wasting our money buying a new one for flare …. for fashion, that’s all. We should look at replacing the things we own (the things we have deemed valuable enough to keep in the first place) as a last resort. In the event that the dinglehopper is no longer fully functional, this is a different story almost entirely. But even THEN, there may be other possibilities than replacing it that are more reasonable. Consider renewing the dinglehopper. Clean it up, fix it, and/or replace some of it’s parts to make it functional again. 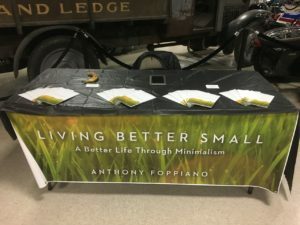 Doing so will often be much cheaper, and will renew our appreciation for the things we own. We might be surprised at how satisfying it is to breathe new life into our valued possessions. I recently noticed that my BBQ grill had some wear an tare on the grilling grate; it was really rusting and warping a little. My initial reaction was: “Ok, it’s time for a new grill.” But then my practical efficient minimalist mind kicked in. It was at this moment I remembered how many years of good service this grill gave us. How many meals, how many gatherings we had around this barbecue grill. I then examined the grill entirely and noticed that the entire grill with the exception of the grate was still in excellent working order. Even the ignition button was still working (and it was the original one). Sure the grill was a bit dirty and faded, but all that is irrelevant. It was more than functional. So I removed the grate on the grill and tossed it, disassembled the rest of the grill and gave it a good cleaning. 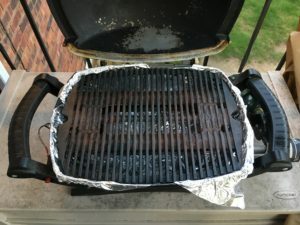 A steel wool, water, and dish soap, and less than one hour later, I had restored much of the luster that the grill used to have. I ordered a new grate for the grill which was a mere fraction of the price of ordering a whole new grill. The result is that now I get to keep a grill that has served us so well for over 10 years, and renew it to full function (now that it has a grate that is not toxic with rust). And I do this at a significantly lower price and time commitment than getting a new barbecue grill.